The land of festivals, India is captivated celebrating the birth anniversary of Hindu Lord Rama. Also observed as a part of the spring Navratri, this year Ram Navami falls on April 13, and Vaishnava Rama Navami will be celebrated tomorrow, April 14. On the auspicious occasion, devotees across the nation are in their festive mood and photos, and videos of the festival have already begun to surface on social media. 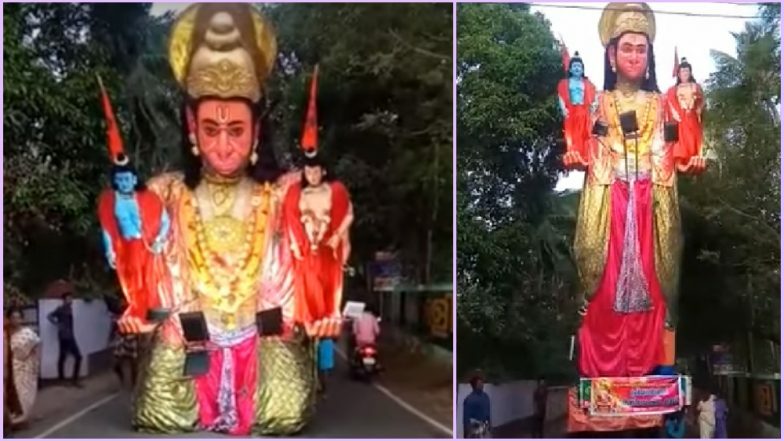 One such is a massive Pawanputra Hanuman Ji statue holding Shree Ram and Goddess Sita, unfolded on a busy street to celebrate Ram Navami 2019. The viral video has fascinated the netizens, who are sharing them on the internet, starting from Instagram to YouTube. Sudarsan Pattnaik Creates Beautiful Shree Ram Sand Art to Celebrate the Hindu Festival. Worshipped by many who wish to gain courage in their lives, Lord Hanuman is probably one of the most celebrated and revered figures in Hindu Mythology. He was and one of the central characters in the Hindu epic Ramayana and an ardent devotee of Lord Rama. And this viral Hanuman Ji statue rightly depicts his devotion to Lord Ram and Sita, as it chants, “Jai Shree Ram,” while it unfolds to a giant figure. Through the video, it is not clear, as at which place exactly the statue has been revealed, but it is certain that you cannot miss watching on the occasion of Rama Navami 2019. WhatsApp Stickers, SMS, GIF Image Messages, Facebook Photos & Quotes to Send Greetings on the Auspicious Ram Navami. The birth anniversary of Lord Rama is marked by Ram Katha recitals or reading his brave stories. Many Hindu devotees visit nearby temples, others pray within their home, and some participate in a bhajan or kirtan with traditional music as a part of puja and aarti. Above all, it is the popular cities mentioned in the Ramayana legends about Lord Ram’s life observe major celebrations that include Ayodhya, Haryana, Haridwar, Sitamarhi in Bihar, Rameshwaram and many locations.